A federal indictment says the intended victim goaded Tyler Barriss into sending armed police to the wrong Wichita address. Tyler R. Barriss, the California man accused of phoning in a hoax 911 call that resulted in the death of an unarmed man at the hands of Kansas police last year, and two other men now face federal charges — including the intended victim of the hoax — according to an indictment that was unsealed Wednesday. Barriss, 25, has previously been charged in Sedgwick County, Kansas, in connection with the death on Dec. 28 of Andrew Finch. Finch, 28, was unarmed when he was shot by police responding to Barriss' call with a fake story about a shooting and kidnapping at the home in Wichita, according to court documents. Barriss was extradited to Kansas to face state charges. A Los Angeles police detective testified at a preliminary hearing Tuesday that "to cut to the chase, he confessed" to having made the hoax call — a technique called "swatting" that is intended to harass someone by sending emergency personnel rushing to the unsuspecting victim's home. On Tuesday, a federal grand jury in Wichita also indicted Barriss, along with Casey S. Viner, 18, of North College Hill, Ohio, near Cincinnati, and Shane M. Gaskill, 19, of Wichita on a complicated series of interlocking charges that include cyberstalking, threatening to kill or cause damage by fire, obstruction of justice and wire fraud. 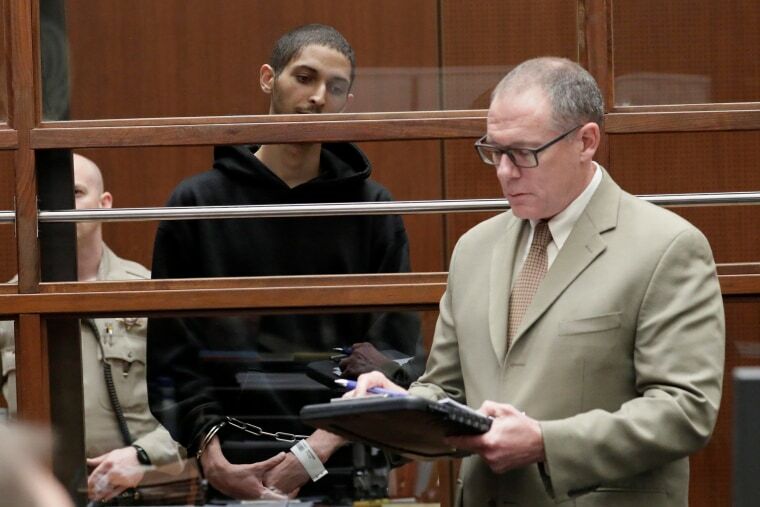 The twist to the case is that Gaskill was supposed to have been the victim of the swatting, according to the indictment, which was unsealed Wednesday in U.S. District Court. But it says Gaskill learned of the swatting attempt in advance, "confirmed" the incorrect address to Barriss in electronic messages and goaded him with obscene dares and taunts about his masculinity. No attorneys of record for Viner or Gaskill are listed in court records. According to the indictment, Viner and Gaskill were playing the online game Call of Duty World War II when Viner got upset at Gaskill. It says Viner then contacted Barriss and asked him to swat Gaskill, passing along an address that Gaskill had previously provided. Barriss then followed Gaskill on Twitter to research him and the address, according to the indictment. But Gaskill noticed Barriss' activities, and in a series of obscene messages, he taunted Barriss to "please try some s---," saying "I'll be waiting" and "You're gonna try and swat me its hilarious"
At one point in their exchange, Gaskill directly gave Barriss the same, inaccurate address, writing "I don't got s--- to hide" and accused him of being gay, according to the indictment. Barriss began calling Wichita police within 20 minutes to report that he was at the Wichita address, where he reported that his mother had struck his father with a gun and that he had subsequently shot his father in the head, according to the indictment. As authorities were on their way to the address, Barriss upped the stakes by telling a Sedgwick County dispatcher that he was holding his parents hostage in a closet and was preparing to pour gasoline all over the house and set it on fire, according to the indictment, which says he again gave authorities the fake address that Gaskill had provided to him and Viner. When authorities arrived at the address, it turned out to be the home of Finch, who had no connection with any of the defendants, authorities said. Police said one of the officers who responded fired his gun after Finch moved his hand toward the area of his waistband. Finch, however, wasn't armed. Wichita Deputy Police Chief Troy Livingston said later: "Due to the actions of a prankster, we have an innocent victim." According to the indictment, Gaskill and Barriss resumed their online communication a short time later, during which Gaskill continued to taunt Barriss, telling him: "They showed up at my old house retard ... They showed up to my old house that we own and rented out We don't live there anymore bahahaha"
Two to three hours later, however, once the fatal shooting had been reported in the media, Gaskill got scared, according to the indictment, which accuses him of contacting Barriss once again to urge him to "delete everything" because "this is a murder case now"
The indictment says that Gaskill told Barriss that Viner had already deleted all records of their communications and that "you need 2 as well"
"This isn't a joke K," Gaskill told Barriss, according to the indictment. "If you don't you're literally retarded I'm trying to help you both outThey know it was swat call"
The 18-count indictment charges the three men both separately and together. Barriss is charged alone with giving false information and hoaxes to investigators, cyberstalking, threatening to kill another person or damage property by fire and communicating interstate threats. Barriss and Viner are charged together with seven counts of wire fraud and a single count of conspiracy. Viner and Gaskill are charged together with obstruction of justice and conspiracy to obstruct justice, while Gaskill is charged alone with wire fraud and two counts of obstruction of justice. The federal case could be delayed for some time. Sedgwick County Judge Bruce Brown ruled Tuesday that there was sufficient evidence for Barriss to face local charges of involuntary manslaughter, giving a false alarm and interfering with a law enforcement officer. He is scheduled to be arraigned in that case late next month. On Thursday, federal prosecutors in Washington said Barriss was indicted on charges related to two hoax bomb threats made to FBI headquarters and the Federal Communications Commission late last year. A federal grand jury returned indictments against Barriss on two counts of threatening and conveying false information concerning use of an explosive, the U.S. Attorney’s Office for the District of Columbia said in a statement. The bomb threats occurred in December, the government said, and no explosives were found. The Dec. 14 bomb threat to the FCC prompted a meeting to be halted and the building to be evacuated. The meeting was about the controversial net neutrality issue, it was reported at the time.